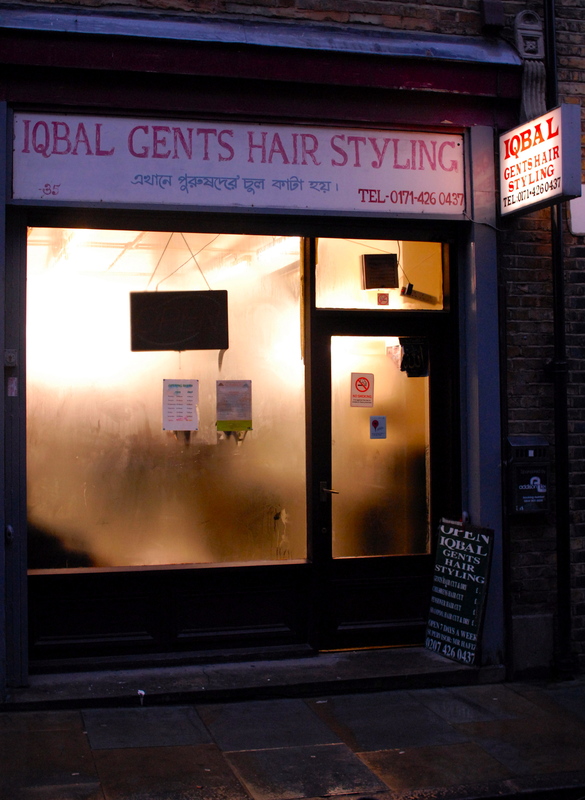 Spitalfields is full of barbers, though you might not realise it at first because there are only a couple on Brick Lane (where, coincidentally, Sweeney Todd was born at number 85 in 1756). But a foray into the sidestreets reveals more, and a stroll over towards Bethnal Green or down to Whitechapel will discover others nestling in alleys and appropriating unexpected spaces. Thankfully, most barbers remain resolute as small personal enterprises that speak of the diverse personalities of their owners and the culture of their clientele. I am fascinated by these rare places where men are constantly going to be shaved and trimmed and where, almost uniquely, it is acceptable for men to allow themselves to be vulnerable in a public place, as they submit themselves to the barbers for intimate grooming rituals. Above all, these are masculine spaces, designed for the comfort of men, run by men for men and where women rarely venture. 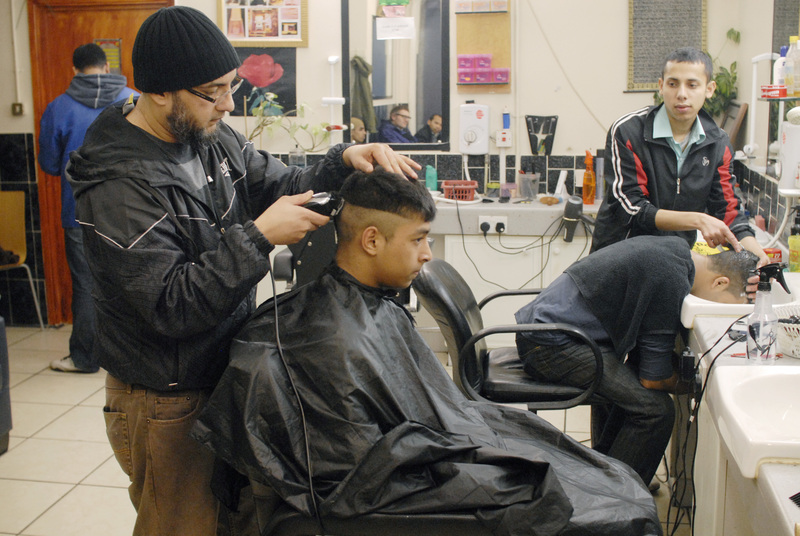 They are utilitarian in appearance by contrast with the decoration of women’s salons, yet I surmise that men are the more frequent visitors to their barbers. 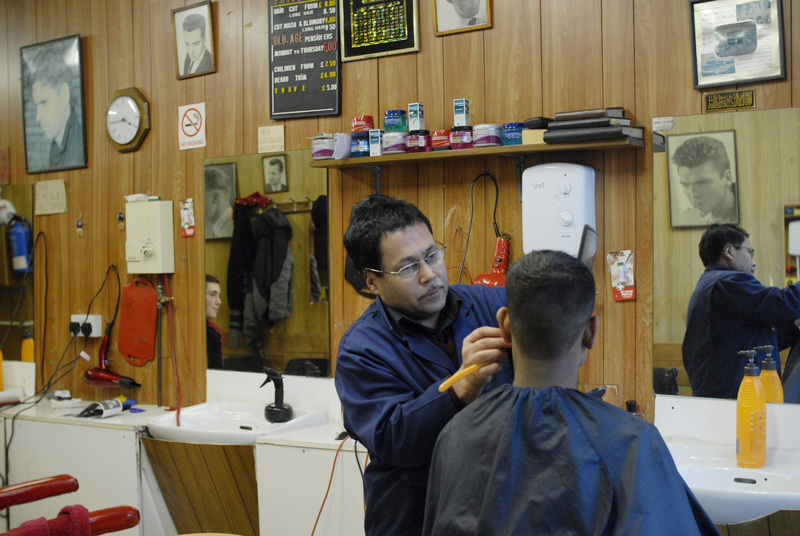 It seems paradoxical that barbers have such large windows (although obviously good light is required for shaving with a cut-throat razor), when the activity inside is of such a private nature, possibly accounting for the predominance of barbers in side streets. 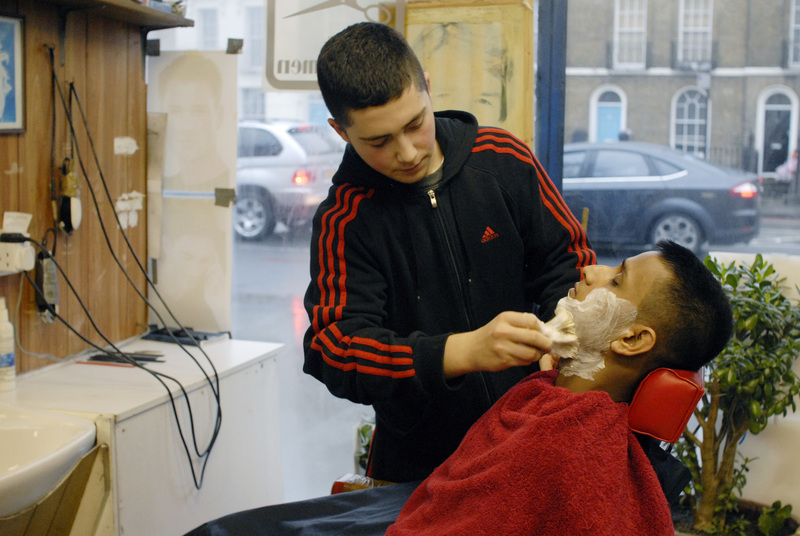 On the day I set out with photographer Sarah Ainslie to visit some barbers, we could not see into many because the windows were steamed up, creating a visible manifestation on the exterior of the emotional intensity within. 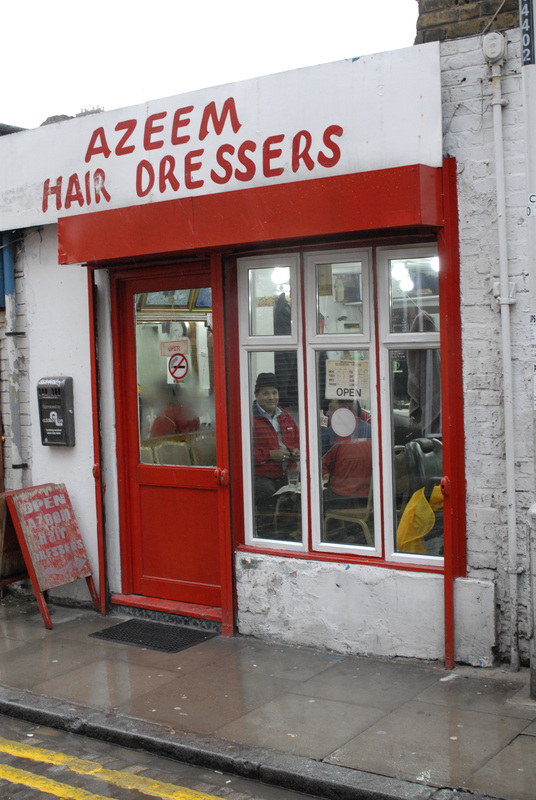 I was eager for the opportunity to assuage my curiosity about these salons because, as you know, I always get my hair cut at the morgue, but I had reason to question my own enthusiasm as we set out through the sleet on an especially grey afternoon. However, on each occasion as we stepped from the cold street into the warm humidity of the salon, we were met graciously by the barbers and their clients, who even consented to permit a woman to photograph them in their moment of exposure, as long as a certain distance was maintained. As I observed the men facing up to Sarah’s lense, I realised that there was an element of display involved, an element of masculine pride, even an element of vanity. Now I knew why barbers have huge windows, the expanse of glass creates a theatre where customers become protagonists in a drama enacted for the audience on the street. My assumption was confirmed when we arrived at a salon where the window was entirely free of condensation and the barber was shaving a handsome young man in the seat next to the window onto a busy street, as if to advertise the prowess of his masculine clientele, implying that any passerby could join this rank of heroes simply by coming in for a trim. Starting in Brick Lane, Sarah and I wove our way through the sidestreets on our bizarre pilgrimage, drifting down through Whitechapel and further South as far as Commercial Rd in the unrelenting damp. We visited big salons and tiny salons, full salons and empty salons, sleek new salons and crumby old parlours. And every one secured a different place in my heart because each possessed a different poetry, a poetry that celebrates human life and hopes, equally containing the mundane need to be tidy alongside the aspiration to be be your best. 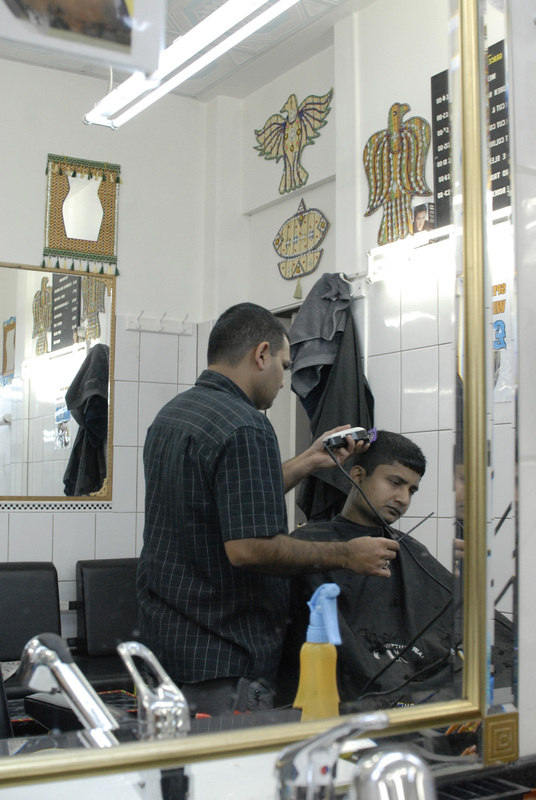 The humble barbers shop is an oasis of peace and reflection, where cares are shorn away to allow a fresh start. This is where men go to get renewed. We were told to go in search of Charlie, a legendary barber in Stepney, and eventually we found him exactly where we were told he would be, except his name was actually Michael, but we were still delighted to encounter this genial Turkish barber, who without a doubt was the afternoon’s star turn. 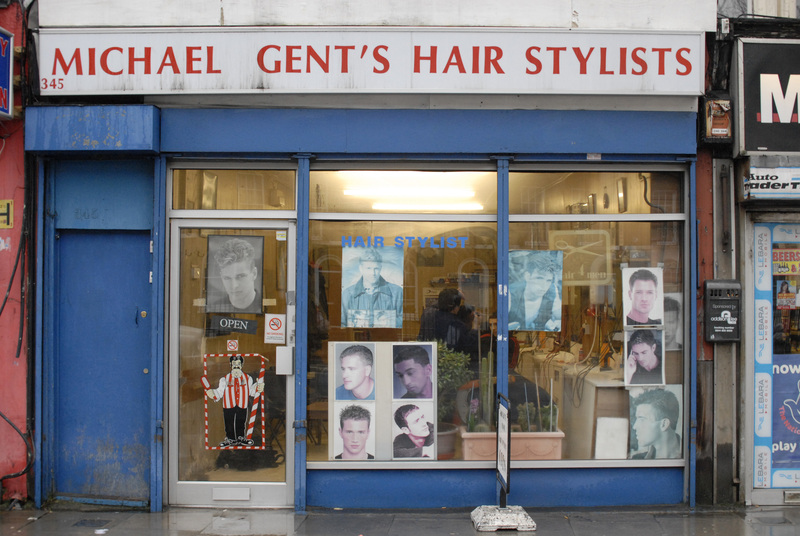 To the uninitiated, Michael Gent’s Hair Stylists at 345 Commercial Rd is the most unremarkable barber’s shop you could imagine, but this modest salon has been in operation for over a century. Michael, a sprightly garrulous mustachioed gentleman in a neat blue overall jacket, who has been cutting hair here for thirty-two years, told me he took over from Maurice Pem, a Jewish barber, who was here for thirty-six years and whose unknown predecessor cut hair for at least forty years before that. “All the time, I miss Istanbul,” revealed Michael striking a pensive note, mid-haircut, gazing out at the low cloud in Stepney, as if he could see the towers of the Blue Mosque emerging from the haze, “The city is like a dream.” A moment of nostalgia that led us into a discussion of the work of Orhan Pamuk, before Michael declared himself an Anglophile, “I love this country, the democracy – the country of equality and opportunities.” he said. Then, without a break in our conversation, he completed the haircut, unsheathing a ferocious cut-throat razor and tidying up the edges automatically before instructing his amiable teenage son to lather up the young man swathed in a red towel, prior to a shave. I could but admire the faith of this fellow in the chair, who never even blinked when Michael casually suggested his son might like to have go with the razor to practise his shaving technique. 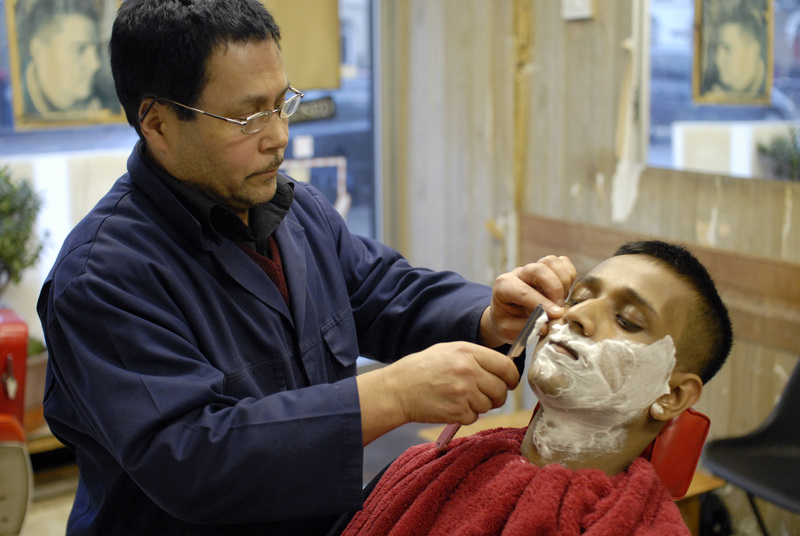 I did not like to ask if it was appropriate to practise on the customers with a cut-throat razor. If the young man had flinched, he might have lost his nose, and I could barely draw breath as Michael berated his son’s clumsy attempts at scraping the stubble, causing the unfortunate apprentice to redden with frustration. Michael is too much of a professional to expose his customers to any risk and although the young man kept his cool, I believe it was a great relief to all concerned when Michael took over from his son, flashing a professional smile and gripping the young man’s face firmly in one hand while using the other to skim the razor over his jaw with bold strokes – demonstrating, as if to an invisible lecture theatre, exactly how it should be done. With a skill his son will master one day, Michael achieved results almost instantly, pinching the customer’s face and caressing his tender skin proudly. “Look at that, as smooth as a baby’s bottom!” he announced in unselfconscious triumph to the entire salon with a smirk, patting the young man’s cheek in proprietorial affection. My Great Great Great Grandfather used to live at 85 Brick Lane! I believe it’s where BengelCity now stands. Thanks for a glimpse into an unfamiliar world. Great post. I like that you cover all the aspects of Spitalfields life and not just the ones that armchair Anglophiles would like to hear about! And I liked Michael’s split proclamations of affection for his native and adopted countries. A true emigre. A foot in each land. An enjoyable read as ever!